Thank you for giving a home to a rescued dog from Holly Hedge Animal Sanctuary, we wish you many years of happiness together. Here are a few guidelines to help you settle your new dog, if you have any queries please contact the Holly Hedge office where we will be only too pleased to help. When you collect your new friend you should have been informed of any previous history we may have. It is our aim to give you as much detail about their past as we can, although in some cases the dog is handed over to us without any background particularly if they were a stray. We do our best to give an accurate assessment of their character. The history of your pet will tell you a lot about your new friend; about their personality and their behaviour. You will also be given details of their medical history and their dietary information during their stay with Holly Hedge. Finally you will be given a copy of the adoption form. We recommend that you register with a vet straight away, don’t wait for an emergency. An older rescue dog may take a while to settle in to their new home, and you may need to give them time to adapt to new surroundings. It is important to remember that some of these dogs have suffered in the hands of previous owners and, if that is the case, your dog may be nervous in certain situations. Kindness & patience will help them overcome their fears, so please be patient. If you have adopted a young puppy you will probably find that they settle into your new home more quickly. Your dog should have a bed of their own; so that they can get away from the family should they feel the need. It will also provide them with a spot in which they feel secure. Please try to keep friends/visitors to a minimum until your new dog has settled in. If you have children it is important that you take the time to explain to them that your dog needs a quiet place to call their own until they have got used to their new environment. Do not let your dog get over excited or play tugging/chasing games. Do not let children suddenly startle a sleeping dog. Please be aware that your dog may have been abandoned because they reached a stage where being pulled about by youngsters was just too much for them. Remember, if you take the time to educate youngsters and adults alike to treat your dog with the respect and care that they deserve – you and your family will be rewarded tenfold with a friend for life. It is quite normal for a dog to show very little interest in food for the first couple of days, if this does not improve, do contact the Sanctuary or your vet. It is better to feed a dog two meals a day, rather than one large meal (kinder to the digestion). Please do not kill your dog with kindness by overfeeding! Start as you mean to go on if you are happy for your dog to sleep on the furniture or in your bedroom fine, if not make sure you establish the ground rules from day one so as not to confuse them later on. Be prepared for possible sleepless nights whilst your new dog is settling in. Reasons for abandonment are many, but sometimes, due to lack of training, love and attention, a dog may have developed some bad habits. Be firm but kind. Your dog needs to learn what you consider acceptable behaviour, so praise them when they have pleased you. If you are adopting an older dog or a puppy be prepared for the fact that they may not be housetrained immediately. The quickest way to toilet train a dog is by frequent visits to the garden especially after they have been fed, giving lots of praise when they perform, please stay in the garden with them as this will give your dog the confidence they need – don’t just shut them outside and leave them on their own. If your dog is caught in the act a firm no and removal to the garden is all that is necessary, physical punishment is never required. Some dogs may be clean immediately – some make take a little longer. Remember patience is a virtue and that miracles do not happen overnight. Your dog is likely to be bewildered at first; and a little nervous too, as you would be in their situation. They will not understand the upheaval, so do not try to rush things. Your dog will settle down given time. Bear with him, show him kindness, love and patience and you will have a friend for life. Exercising your new dog. Do not let your dog off the lead for at least 3 weeks, during that time it is best to use a flexi-lead with a soft collar when exercising them. Start by calling their name and pulling them back towards you at frequent intervals with lots of praise and a high value treat when they are close to you again. When you are ready to let your dog off the lead find a safe place that is fenced in until you are sure they will return when called. Train your dog to be obedient, not regimented. If you have no experience of training it is a good idea to register with a dog training class as this will not only help with training but have the added benefit of getting them used to mixing with other dogs in a controlled environment. If you are experiencing behavioural problems please contact the office and we will assist in any way that we can, to help you overcome any problems you feel you need help with. Regularly worm your dogs every 3-4 months. Regularly de-flea your dogs with a product from your veterinary surgeon. Make sure you keep up with annual booster injections. 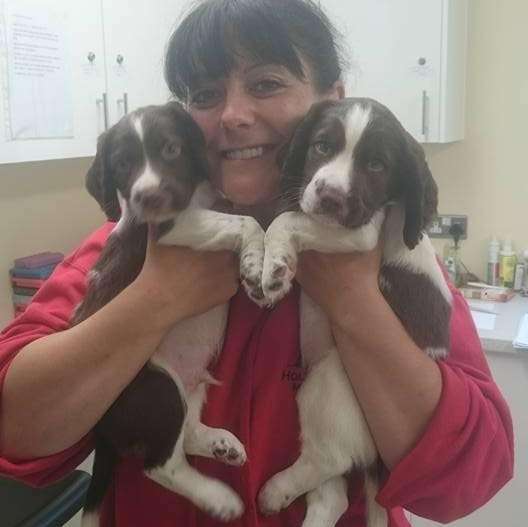 Make sure that your dog is neutered to help stop the cycle of unwanted puppies – dogs obtained from the sanctuary will be neutered with the exception of puppies. ; Make sure you scoop that poop! Make sure you contact your veterinary surgeon if your dog appears unwell. Make sure your dog is given plenty of love and affection. Make sure your dog receives a good healthy diet. Make sure your dog gets regular exercise this will vary depending on breed/size of dog. Make sure your dog is regularly groomed (long haired dogs clipped especially during summer months). Please note that the dog remains the property of the Sanctuary and must always be returned to us should the need arise – dogs cannot be passed on to other owners. If you change your address please inform the Sanctuary.